I awoke early to a fog filled bay. After a clear night, all the heat had escaped and the cooling brought a thick but short-lived fog. By 10:30am, the sun had conquered the fog and a beautiful day was revealed in Napier Bay. It did not take long for everyone else in the bay to lift anchor and go their way. Our plan was to make it a lazy morning since slack tide at Stuart Narrows was at 2:41PM and it was less than an hours cruise from where we sat. I continued to unpack and organize all “the stuff”. 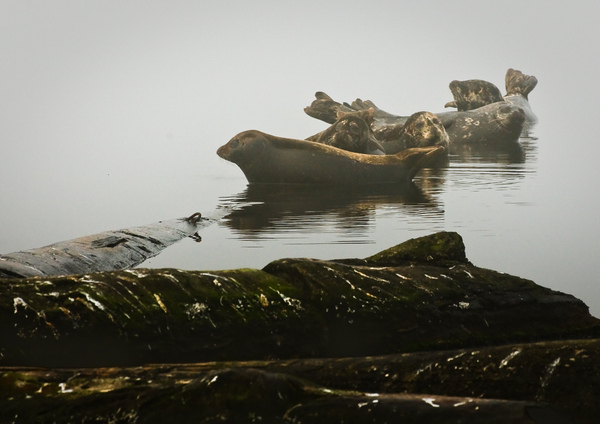 The morning calm was broken up by a handful of harbour seals that had taken refuge on a neighboring log. Apparently breakfast was not yet being served, so they hauled onto the logs and awaited the dinner bell. I took the opportunity to try my longest lens and see if I could take some foggy morning pictures. The critters are certainly camouflaged for their environment. 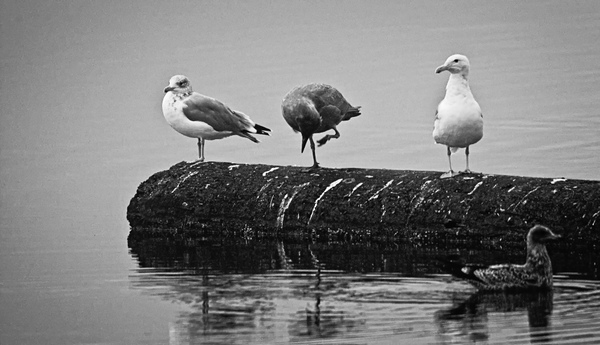 With their dark spotted fur, they look just like wet logs that are spotted with seagull poop. See if you can pick out the seals for the logs. Between the extra time we had and the push of the changing tide we idled most of the way to the narrows. Even so we still had a little time to kill before slack tide, so we pulled into Helen Bay and did a slow once-around. One the shore is a memorial to two tugboat captains who lost their lives at Stuart Narrows. A reminder that these natural funnels can create currents that can best even the most experienced mariner. 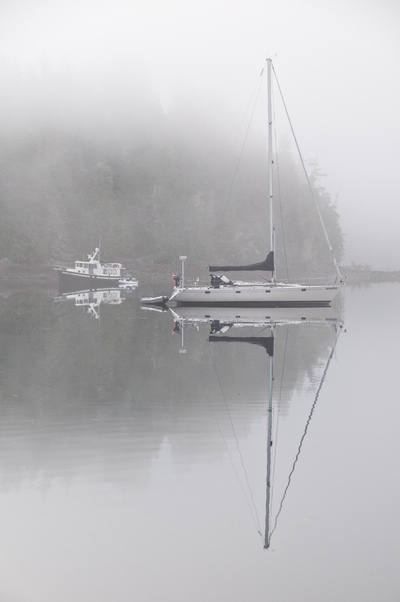 Two boats joined us in Helen Bay: another Grand Banks and a Fleming 55 named Couverden. The Fleming was drift fishing and they would get out into the strong current and drift toward the narrows, fishing all the way. When they got close enough, they would power away from the narrows, go up-current, cut their engines and do it all over again. One thing I have learned is that fishermen can find a way to turn any circumstance into a reason to drop a line. Our transit through Stuart Narrows was uneventful, as planned. It never ceases to amaze how these turbulent parcels of water transform themselves into a millpond for a brief few minutes during slack water. Karen had made a last minute call and changed our destination from Richmond Bay to Davis Bay. It was a very good call. Lying at the end of a little passage, this small bay is as pretty as they come. Perfect for one boat, you anchor near to the shore and face West in anticipation of a beautiful sunset. It provides reasonable protection, and what you give up in 360 degree protection, you get back in beautiful views back out into Drury Inlet.